Broadcast a wide variety of media to your channels and screens. Mix and match video, images, text, dynamic data feeds, even web pages. Pick from our library, or design your own digital signage templates and tickers with full control over fonts, colors, positioning, backgrounds, & more. Everything is drag-&-drop. InfoVue comes out of the box with beautiful local weather & traffic that you can drop in your playlists instantly. Pick from our library of optional, ready-made content & data feeds to keep your channels fresh. Everything from keyword-filtered News, Sports, Local Events, Entertainment, Health, & more, all fully licensed for broadcast use. Multi-zone signage applications can be downright confusing to operate and manage with so much going on. 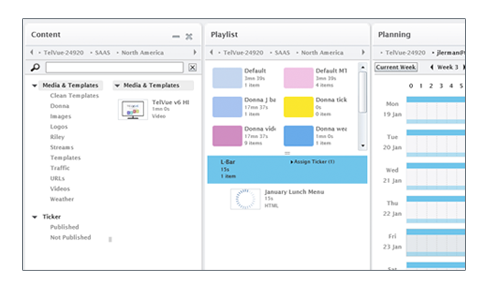 InfoVue makes it a snap with a simple clean layout that puts core user, content, playlist, and schedule management on a single page! All with drag-&-drop simplicity, right from your browser. The InfoVue Data Feed Manager makes it easy to tap into a world of information feeds to populate your InfoVue screens. Add RSS, XML, and create your own custom InfoVue server feeds. Drag-and-drop the fields you want to display onto your templates and tickers to create stunning signage that literally feeds itself! Custom feeds are perfect for menus, school closings, community events, and anything you can dream up. You can even allow your contributors to self-manage their custom feeds. It is as easy as updating text in a spreadsheet. Update players immediately or on schedule. Scheduling InfoVue is easy yet sophisticated. You can manage content day-parts and validity windows, and schedule screen layout changes. Drag-and-drop playlists into a schedule or even shuffle them for variety. Copy/paste your scheduling segments. Set time limits and interleaving. Get full as-run reports and much more. Turn your channel into a true hub of information. Create an unlimited number of users. Assign groups and roles for full control over who can access what. Player monitoring with email alerts. In this age of user-driven content, it’s easier than ever for your contributors to update their own announcements. All of your data and content is automatically backed up. Eliminate complex networking, configuration, software installs, content backups, hardware headaches, and accessibility issues with the power of the cloud. Media and schedules are synchronized to your local player, so in the event of loss of Internet connectivity your channel continues to display perfectly. InfoVue gives you more and better ways to communicate with your audience. The InfoVue Template Designer allows you to present multiple forms of media on the screen at the same time. Create zones for video, images, text updates, web pages, live streams. Customize the look and feel of your templates. Add media to your templates or playlists, then schedule. Supports SD/HD video – in all popular formats – audio, images, HTML5, Flash, and streaming media. 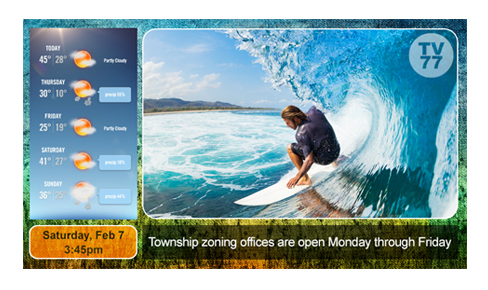 The TelVue InfoVue Content Management System (CMS) – a cloud-based digital signage management application featuring drag-and-drop template design, content, schedule, and user management – securely accessible from your web browser, no matter where you are. 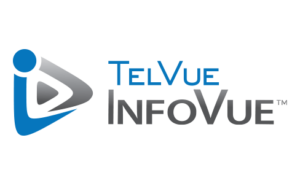 The TelVue InfoVue Player – a professional, broadcast-quality digital signage player appliance that securely pulls content, data, and schedules from the InfoVue cloud and renders the video output locally for display. InfoVue Players come in two models. Both will display the same beautiful InfoVue content you create. The broadcast quality InfoVue Pro server supports both HDMI and IP output, making it perfect for broadcast applications. 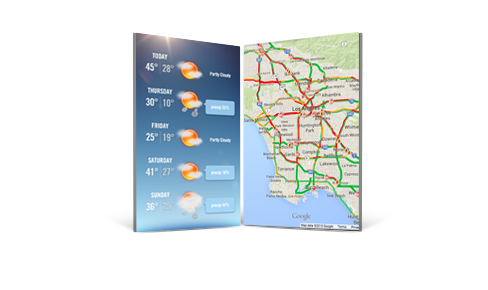 Integrates seamlessly with the TelVue HyperCaster broadcast platform to automatically fill programming gaps with dynamic signage integrating news, weather, social media, program guides, community information and more. The broadcast IP output makes InfoVue Pro the most cost effective way to manage and deliver multiple unique signage channels to a large number of displays, where multiple displays are showing the same content. The incredibly compact InfoVue Stick plugs directly and discreetly into the HDMI port of any display and updates over WiFi or optional wired connection. It may be small and behind the scenes, but it packs a powerful punch supporting up to 1080p output and all of the eye popping and dynamic InfoVue features. Great for everything from single screen to multiple screen digital signage deployments and deployments that require unique content per screen.